In today’s world, people seem to like to make things complex. We now have more ways to fill our time, more things to keep us busy and get done, and in business, more ways to market than ever. One way people are marketing their business is by creating a blog. But like everything else, simplicity is not always a part of the formula. When a business fails to make things simple or a habit, it often gets inconsistent. 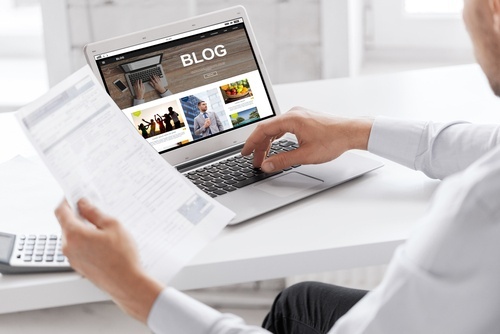 Blogging is a great way to reach and connect with your consumers and potential customers – which is why it can be beneficial to put an emphasis on simple blogging. In fact, rather than overthink your blog, implement a few simple small business content marketing tips to make it succeed. The first step in simple blogging is to create a short list of attainable goals. Think about what it is you want to accomplish: growing your readership, boosting your website traffic with content, or posting more consistently? Make sure they are actionable goals that can be accomplished easily. Don’t make them an annual or long-term goal but something that will get done and inspire you to keep blogging. To create a great list of topics and titles, brainstorm what your audience is looking for. This can be done a few ways. Start by listing the most common questions you get as a business. For example, a landscaping business may get asked frequently, when is the best season to start my garden? There is a topic/title. Also, address your biggest complaints, consumer issues, trends in your industry, or uses for your services or product. The goal is content readers want to read – and often, those answers and ideas come from information you already have or can find easily. A quick look at successful small business content marketing shows that there is a consistency in style, tone, and voice. Maybe each blog should have a title, graphics or pictures, subtitles, and a call-to-action at the end. Decide what you want to develop and create a quick style guide from your ideas and thoughts. Whether you hire a freelancer, use a content service, or have someone in-house, you want skilled writers who understand content marketing. Your style guide and some communication will allow you to convey what you want. Be patient, and work together with your writer(s) until the content hits the mark. Also, as a business, you may be a bit more hands on about what you want, but remember that simple blogging is your goal. Don’t overthink, overdo, or overwrite. The content is for the audience—so think about the final product with the audience in mind, and realize their background and knowledge is most likely closer to the writer’s than the business owner's. Of course, there are exceptions, and you can plan for blogs that require more technical content accordingly. If you aren't sure whether you should hire freelance writers or keep it in-house, check out our white paper, "Content Writing Outsourcing vs. In-House Writers." If you don’t get blog uploads scheduled, it makes it harder to actually blog regularly. Most businesses schedule employee hours, meetings, and many other tasks, so get in the habit of scheduling your blog as well. What days are ideas due? Articles? And what are your upload days? Do what it takes to stay on task so your blog can grow and see success. One of the biggest roadblocks businesses face is taking on too much too fast. Instead of starting big, start with simple business blogging and content before expanding your blog’s role. You may find that simple works best for your company. Keep making new goals and strategies until you strike that perfect balance. If you need help getting your content strategy up and running, read our white paper, "What is a Digital Content Strategy? Any Why You Need One!"